De nombreuses organisations de femmes et féministes organisent des événements dans le cadre de la Conférence Rio + 20 et du Sommet des peuples. Le "Groupe majeur femmes" fait partie des représentants de la société civile à la Conférence internationale Rio + 20 sur le développement durable. Il organise des événements ("side events") sur les enjeux "Droits des femmes et développement durable". Programme à télécharger en pdf en bas de cet article. Un grand nombre de réseaux brésiliens et internationaux de femmes organisent un espace de réunion et de débats dédié aux femmes à l’intérieur du Sommet des Peuples, le "Territoire global des femmes". Cet espace situé au Parc Flamengo ) à hauteur de la rue Silveira Martins et du Musée de la République. ABGLT- Associação Brasileira de Gays, Lésbicas, Travestis e Transexuais ;/ ABL- Articulação Brasileira de Lésbicas ; / AFA - Asian Farmer Association ; / AFM – Articulacion Feminista Marcosul ; AMB – Articulação de Mulheres Brasileiras ; /AMNB – Articulação de Mulheres Negras Brasileiras ; / ANP – Articulação Nacional de Pescadoras ;/AROAJ - Asociación Raxch’och’ Oxlaju Aj – Guatemala ; / CENERAB – Centro Nacional de Religiosidade e Resistência Afro Brasileira ; / CIR - Conselho Indígena de Roraima - Secretaria de Mulheres ; CLADEM - Comité de América Latina y el Caribe para la Defensa de los Derechos de la Mujer ; / CONAMI - Conselho Nacional de Mulheres Indígenas ; CONEN- Coordenação Nacional de Entidades Negras ;/ DAWN - Development Alternatives with Women for a New Era ; / ECMIA - Enlace Continental de Mujeres Indígenas de las Américas ; / FEMUCARINAP - Federación Nacional de Mujeres Campesinas, Artesanas, Indígenas, Nativas y Asalariadas del Perú ;/ Fórum Nacional de Reforma Urbana - GT Gênero e Raça ; / Fórum Social PanAmazonico ; / Huairou Commission ; / IATP – Institute for Agriculture and Trade Policy ; / International Women’s Alliance / Marcha das Margaridas / CONTAG ; / MIQCB – Movimento Interestadual de Quebradeiras de Coco Babaçu ; / MMC – Movimento de Mulheres Camponesas ; / Mulheres do Xingu Vivo para Sempre ; / RECID – Rede de Educação Cidadã ; /REPEM – Red de Educacióm Popular entre Mujeres ;Red de Mujeres Afrolatinoamericanas Afrocaribeñas y La Diáspora ; /Red Latinoamericana de Católicas por el Derecho a Decidir ;/ Red Mujeres e Habitat ; / Rede de Mulheres da AMARC - Associação Mundial de Rádios Comunitárias ;/ Rede de Mulheres em Comunicação ;/ REDSAG - Red Nacional en Defensa de la Soberania Alimentaria de Guatemala ;/ Rural Women´s Assembly - África do Sul ;/WIDE - Globalizing Gender Equality and Social Justice ;/ UNITIERRA Guatemala. Social equity, gender equality and environmental justice must form the heart of sustainable development, and of the outcomes of the Rio+20 UN conference. Twenty years after the first Rio conference, great social and economic inequities still remain. These inequities especially affect women and children, who make up the majority of those living in poverty. The women’s major group supports the transformation from the current economic system to a sustainable and equitable economic system, which ensures gender equality, human rights and environmental justice and supports sustainable livelihoods and poverty eradication. This side event will present testimonies from women resisting extractive industries, unsustainable energy, agro-fuels and land-grabbing attempts. The side event will also show examples of women’s initiatives towards sustainable and equitable economies followed by an interactive discussion on lessons for international cooperation and national and local action. 10:35 - 10:55 Open Discussion : Post Rio+20 what are key areas for activism and policy-making to secure women’s rights and support for women’s sustainable development initiatives ? 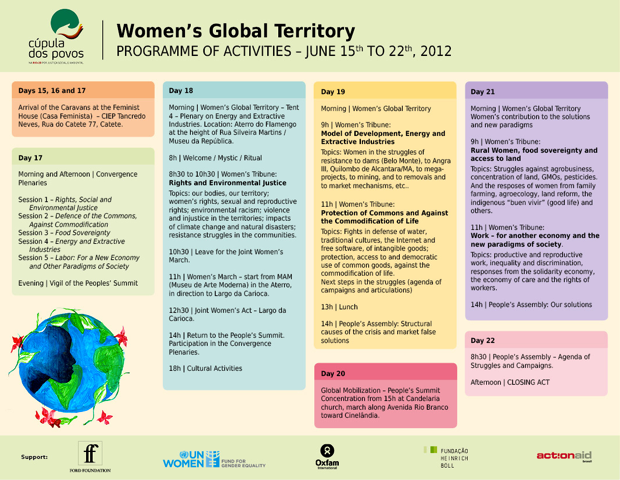 The Women’s Major Group Rio+20 activities receive support from the Federal Ministry for the Environment, Nature Conservation and Nuclear Safety, UN Women and Sustain Labour. This event will explore the current patterns of economic growth in Africa, Asia Pacific, and Latin America and its impacts on the environment and women’s access to sustainable livelihoods. Panelists will also analyze market based solutions to climate change and discuss why they should be challenged in national and global arenas. Gender equality and women’s rights, including the sexual and reproductive health and rights, as enshrined in the ICPD Programme of Action, are essential in realising a rights-based approach to poverty eradication and sustainable development. It must be reaffirmed in the Rio+20 and Cairo+20 and post-MDGs development framework and agenda. This event will analyse the coherent inter-linkages among these processes and explore the feminist strategies to proactively engage in these processes. Co-sponsored by Development Alternatives with Women for a New Era (DAWN), Realising Sexual and Reproductive Justice (RESURJ), and International Women’s Health Coalition (IWHC). Development Alternatives with Women for a New Era (DAWN) is a network of feminist scholars, researchers and activists from the economic South working for economic and gender justice and sustainable and democratic development, including at the Rio+20 Earth Summit in Rio de Janeiro, Brazil in June, 2012 ! Follow us ! We would like to invite you and your organization to join us in Rio de Janeiro, Brazil for the Rio+20 Peoples’ Summit and participate in the workshop, “Women Resist Militarism and War ! Build a Sustainable Future for La Pachamama !”. The workshop, which is organized by IWA will be held on Saturday, 16 June, 4:30-6:30 p.m., at Tenda 21, Margarida Alves, Aterro do Flamengo. The workshop will feature an audio-visual presentation and a panel of women from grassroots organizations coming from Africa, the Middle East, Asia and Latin America who will share their perspectives and experiences on the impact of militarism and resource wars on women’s lives and livelihoods and the sustainability of Mother Earth. There will also be opportunities to express solidarity and sisterhood for concrete responses of women’s resistance against militarism and wars and to building life-sustaining alternatives. We enjoin you to add your voices to the growing number of women who are resisting the onslaught of imperialist aggression and uniting to build a sustainable future that upholds human rights, genuine peace and social justice.